An exclusive look at the second round of highlights from Frieze, ALAC and Felix LA before the fairs open next week! Enjoy! Born in Newark, New Jersey in 1940, Pat Steir studied art and philosophy at Boston University and received her BFA from the Pratt Institute in 1962. In 1963, she was invited to participate in her first group show at The High Museum in Atlanta. The next year, her work appeared in group shows at the Philadelphia Museum of Art and in The Museum of Modern Art’s Drawing exhibition, making her a key figure among the first wave of women artists to gain prominence in the New York art world. In 1996, Liza Lou launched a highly successful international career with her exhibition of Kitchen (1991-95) at the New Museum in New York, a laboriously detailed, tongue-in-cheek re-creation of a kitchen, every inch of it covered in shimmering glass beads. Like Kitchen, much of Lou’s work is about work, and all of her sculptures, installations, and wall pieces are covered with glass beads. She explores darker themes, like endurance and the division of labor between the sexes, races, and classes, and lighter ones, like the pleasure of looking, in her work. After studying in New York and Paris, Al Held began his painting career by exhibiting Abstract Expressionist works in New York; he later turned to hard-edged geometric paintings that were dubbed “concrete abstractions”. In the late 1960s Held began to challenge the flatness he perceived in even the most modernist painting styles, breaking up the picture plane with suggestions of deep space and three-dimensional form; he would later reintroduce eye-popping colors into his canvases. In vast compositions, Held painted geometric forms in space, constituting what have been described as reinterpretations of Cubism. Jac Leirner's multifaceted work is formulated through a process of collecting and ordering; tapping into what the artist has described as the ‘infinity of materials’. Since the mid-1980s, Leirner has amassed the ephemeral and incidental products of consumer culture, and reappropriated them into visually compelling sculptures and installations that demand to be both seen and read. Jac Leirner is the recipient of the 25th Wolfgang Hahn Prize, and the work, Little Light (2005) from the same series, is included in the collection of MOCA, Los Angeles. Gormley’s work will be the focus of three major museum exhibitions this year. Ten cast-iron ‘blockwork’ sculptures by the artist are displayed on the steps of the Philadelphia Museum of Art. A solo exhibition, titled ‘ESSERE’, will be on show at Uffizi Gallery, Florence, running from 26 February – 26 May 2019. In September 2019, Gormley will have a major solo exhibition at the Royal Academy of Arts, London. Stanley Whitney has been exploring the formal possibilities of color within grids of multi-hued blocks and all-over fields of gestural marks and passages, since the mid-1970s. 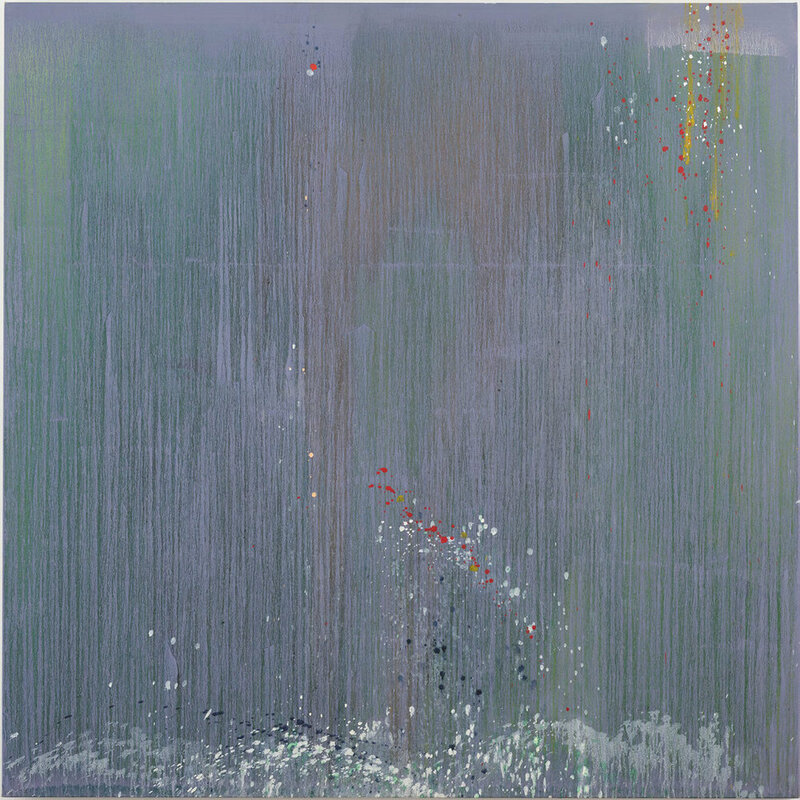 His current motif, honed over many years, is the stacked composition of numerous saturated colour fields, delineated by between three to five horizontal bands running the length of a square-formatted canvas. The cumulative effect of Whitney’s multicoloured palette is not only one of masterly pictorial balance and a sense of continuum with other works in this ongoing series, but also that of formal sensations caused by internal conflicts and resolutions within each painting. Considered one of the founders of the hard-edge style of Minimal, abstract art, Leon Polk Smith (1906 – 1996) rose to prominence in the late 1950s and early 1960s with his distinctive shaped canvas series — the Correspondences. These large canvases typically consist of two vibrantly-coloured painted shapes defined by a precise but often irregular contour. By 1967, Smith's circular explorations introduce additional panels and define his shaped, multi-part Constellation series of paintings and drawings, among his most exuberant and inventive compositions. Erwin Wurm is famous for the One Minute Figures and One Minute Sculptures that he has been making since the late 1980s. In these, he gives instructions to himself, a model or member of the public: the person is asked to perform a certain action, or to interact with an everyday object in a specific way. Falling somewhere between ephemeral sculpture, performance and relational aesthetics, these incongruous (or even absurd) moments have been documented in photographs, drawings and videos. This interrogation of the very definition of sculpture is applied not only to human beings, but also to objects. In his three-dimensional works, in which he variously uses wood, Styrofoam, resin, paint, ceramics and textiles, Wurm often connects deeply emotional and psychological conditions to the human body as an ‘object’. Ruppersberg moved to Los Angeles in the mid-1960s and became active in an emerging scene led by artists such as John Baldessari, Ed Ruscha, William Leavitt, and others exploring the interface of language and image filtered through the lens of mass culture. His early projects—including environments made with found objects; wry, narrative photo works; and a novel copied by hand—began a career-long practice of creating works that prompt both reading and looking, and that intertwine fact with fiction. Perhaps more than any other artist of his generation, Ruppersberg has mined the nuances of culture through its visual details, unsung conventions, and modes of the everyday, often encouraging the involvement of the viewer as social participant. McArthur Binion has maintained an engaging and historic artistic practice that spans over forty years. Sourcing narratives of an African American experience in rural America and his presence in the white-dominated heyday of American Modernism in New York City, Binion has developed a unique style of action painting. Taking wax crayon as his primary medium, Binion’s style has an intentional physicality and texture. The Los Angeles-based artist Math Bass began her career primarily as a performance artist, but she has since expanded her practice to include painting, sculpture, and video. Bass, who explores a myriad of themes in her work, is broadly interested in playing with the tension between movement and containment. Her compositions feature ambiguous content, lending themselves to different interpretations of the same image. In the well-known painting series “Newz!,” Bass employs the symbols and colors of sign systems to create a visual lexicon of her own. 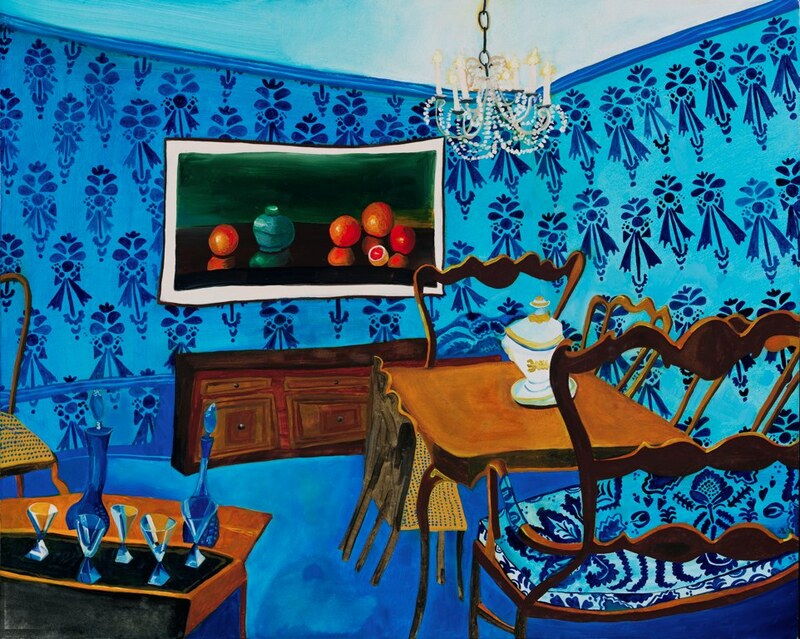 Garland’s intimate, sometimes claustrophobic, interiors are representations of neo-midcentury modern domesticity, each one jostling with detail and specificity. Garland has transduced her drawing methods into paint, allowing her to shift between different kinds of mark making in a relatively condensed space, moving pigment with the ease of a pencil. Brilliant, warped canvases, they express the melancholy of something very familiar that is at the same time ultimately enigmatic. In a practice that combines painting, sculpture, and installation Caitlin Cherry addresses history, identity, and present-day politics and in pursuit of cultural reclamation and the dismantling of structural oppression. To create her narrative compositions and disorienting characters, Cherry draws upon the traditions of art history, integrating contemporary cultural theories on race, gender, economics, and the impact of technologies. Laura Krifka makes paintings, sculptures and videos that dissect common fantasies of power and identity. Her work is both gorgeous and terrifying often dealing with fantasies of beauty and nobility, myth, power, identity seduction and the American dream, exploring the relationship of light and dark through a range of influences from art history to fairyland with a post-modernist twist. Continuing the dialog through concept and material craft, Tanya Aguiñiga weaves her personal narrative in each work; the result is Aguiñiga’s own explorations into identity driven by Latin and Mesoamerican Surrealism, gender relations, and her work with Latin and indigenous communities. Fully tapping into her Mexican heritage through both material and ideological approaches, Aguiñiga digs deep and ponders the resulting questions with a nod to Mexican surrealism and often absurdist explanations of the Popol Vuh, the Mayan creation myth.